1 Views of China’s economic growth are mixed across the Asia-Pacific region. There is little consensus among the seven countries surveyed there about whether China’s growing economy is more of a good thing or a bad thing for their country. Three say the former, two the latter and two are nearly evenly split. Australians are most positive about China’s economic growth; by a three-to-one margin, more people say China’s economic growth is good for Australia than bad. 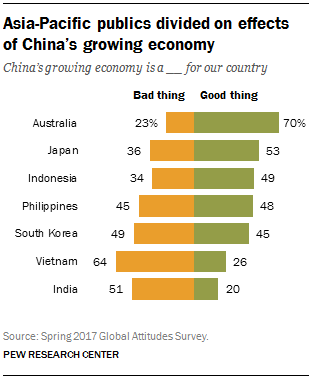 In contrast, only 20% of Indians see China’s economic rise as a good thing for their country. The Asia-Pacific region is also one of the regions where most people name the U.S., not China, as the top global economic power. 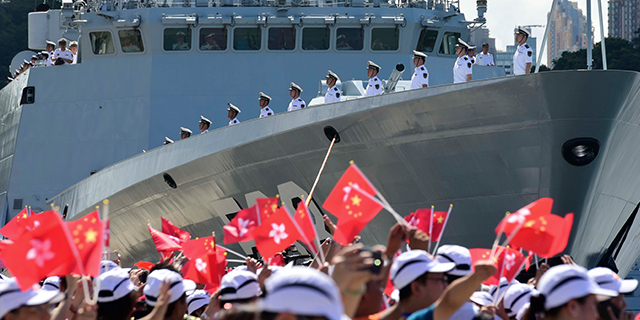 2 Most in the region worry about China’s growing military power. China’s official military budget grew by about 9% per year over the past decade, and few of its neighbors appear to welcome the increase. 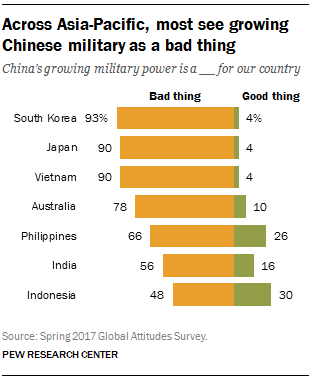 In South Korea, Japan and Vietnam – countries actively engaged in disputes with China over military deployments or territory in the East and South China seas – nine-in-ten or more think China’s growing military power is a bad thing for their country. In India, even before a recent border dispute in the Himalayas, people had a negative view of Beijing by a more than three-to-one margin. 3 Although China’s power and influence is not seen as a top threat globally, many in Asia-Pacific countries see it a key concern. Outside the region, a median of 27% see China’s power and influence as a major threat to their country. But among the seven Asia-Pacific countries surveyed, a median of 47% see it as a major threat. 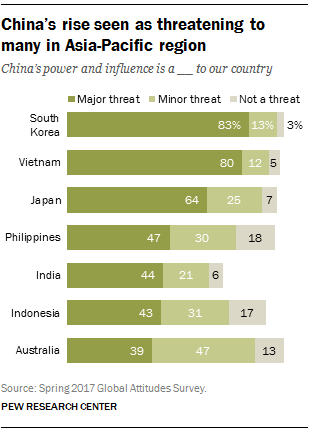 South Koreans and Vietnamese even rate China’s power and influence as the top threat facing their nations. Concerns about China also outpace concerns about the United States across the region; a median of 35% say U.S. power and influence is a major threat to their country. 4 Few in the region express confidence in Chinese President Xi Jinping. Most observers expect Xi to begin his second of two five-year terms at the 19th National Congress. Among China’s neighbors, however, there is limited confidence in him to do the right thing regarding world affairs. 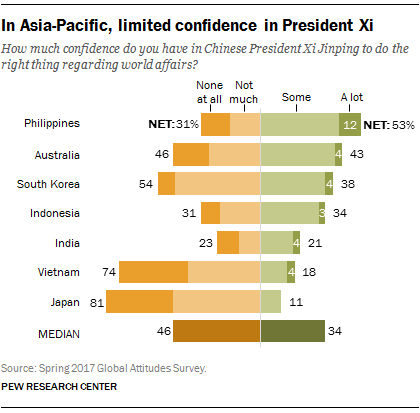 A median of 34% across the Asia-Pacific region say they have a lot or some confidence in him, ranging from a high of 53% in the Philippines to a low of 11% in Japan – a country where not even 1% say they have a lot of confidence in him. In India, Japan, Vietnam and the Philippines, Xi ranks behind U.S. President Donald Trump. Notably, however, in two U.S. treaty-allies in the region, Australia and South Korea, people have more confidence in Xi than in Trump. Note: See here for topline results and methodology.